The rich have gone from being grateful for what they have to pushing for everything they can get. They have mastered the arts of whining and predation, without regard to logic or shame. THE horns have sounded and the hounds are baying. Across the developed world the hunt for more taxes from the wealthy is on. This is basically the argument I see most progressives make regarding taxes. Tax revenue has been going down for years and the gap between rich and poor has been increasing for years. Clearly US economic policy has disproportionately benefitted rich people the most, and they can best afford the tax increase. The article then goes on to endorse an Obama-like tax plan. 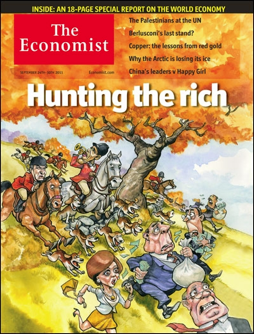 Hunting the rich, indeed. I don’t think that the rich needed a telethon in the 1990’s and prior. They seem to have survived. What is the reason we can’t go back to that tax rate again? ?